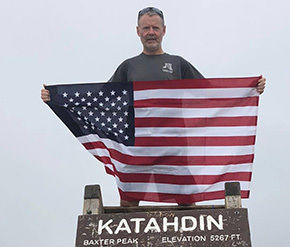 Col. Donald Fallin had been hiking the Appalachian Trail since March in support of a scholarship fund for the children of fallen warriors and recently finished the trail at Bear Mountain. At Springer Mountain, Georgia on March 27, Fallin started up the nearly 2,200-mile trail on a mission to raise awareness and money for the Johnny Mac Soldiers Fund. Fallin established a crowdfunding campaign through GoFundMe subsidiary Crowdrise, with an original goal of raising $5,000 for Johnny Mac. After large contributor responses, and after gaining the attention of the Gary Sinise Foundation, he was able to push the goal to $15,000 and exceeded the goal by $2,000. On a long Columbus Day weekend, Fallin's son traveled from West Point to meet him and hike a portion of the trail with him during a particularly rainy stretch of the hike.